The Alameda-Contra Costa Transit District (AC Transit) will incorporate new hydrogen fuel cell buses as part of its involvement in the Fuel Cell Bus Commercialization Consortium (FCEBCC). This is a comprehensive initiative sponsored by an $8.5 million grant from the California Air Resources Board (CARB) through California Climate Investments, a statewide program that puts billions of cap-and-trade dollars to work reducing greenhouse gas emissions, strengthening the economy and improving public health and the environment – particularly in disadvantaged communities. Additionally, the Bay Area Air Quality Management District (BAAQMD) is providing $1 million for the project, which will deploy 10 zero-emission hydrogen fuel cell buses in the AC Transit service area and make upgrades to an existing hydrogen fueling station at AC Transit’s Emeryville operating division. The Center for Transportation and the Environment (CTE) will provide project management and oversight. Under this consortium award, 10 zero-emission buses will be deployed to AC Transit and another 10 zero-emission buses deployed to the Orange County Transportation Authority (OCTA), all manufactured by New Flyer. OCTA will also be the recipient of a new hydrogen fueling station. The consortium aims to have AC Transit’s and OCTA’s buses delivered and in service for everyday use by December of 2018. In 2005, AC Transit unveiled its first fleet of zero-emission, hydrogen fuel cell buses. The groundbreaking HyRoad Program initially consisted of three buses that ultimately transported more than 700,000 passengers over 270,000 revenue miles. The existing fleet of 13 zero-emission buses now has more than 1.8 million miles of services and carried more than 15 million passengers. 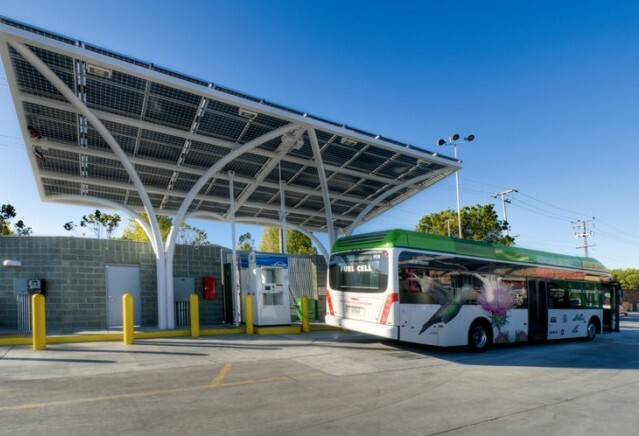 Linde North America currently operates two hydrogen production and dispensing stations for AC Transit’s hydrogen fleet.